You’d be forgiven for thinking that Gleneagles is all about the golf. It’s a golfing hotel. In fact, it was specifically built 90 years ago to be one of the first and finest golfing hotels, and the recent Ryder Cup saw to it that every Sky Sports screen in the western world broadcast pictures of it as a golfing hotel. But there’s a lot more to it than that: behind the great golfing facade lies a glorious world of game, in which burrowing rabbits are welcome and the only small white things disappearing down holes are albino ferrets. I visited the hotel in mid October to try out its new Fair Game package, which brings together taster sessions of shooting, gundog handling and game hawking with a feast of locally shot and sourced food. A hotel of Gleneagles’ standing is unlikely to do things by halves, and the Fair Game package is no exception. The activities included were spot on, with the hawking being particularly good, and the only thing that rankled was the fact that there wasn’t time to try the hotel’s other non-golf offerings, which range from fly-fishing to off-roading in Argocats and miniature Defenders. The morning of our game day was marked by the arrival of the fringe of Hurricane Gonzalo, shaking leaves from the trees and sending the spray of fountains sideways. Fortunately, it also kept the few clouds scudding quickly across the sky and gave us a mostly dry and sunny, if blustery, day. Clayshooting was first on the agenda. The package includes a 45-minute shooting lesson that can be tailored to suit your appetite for a challenge and experience level. 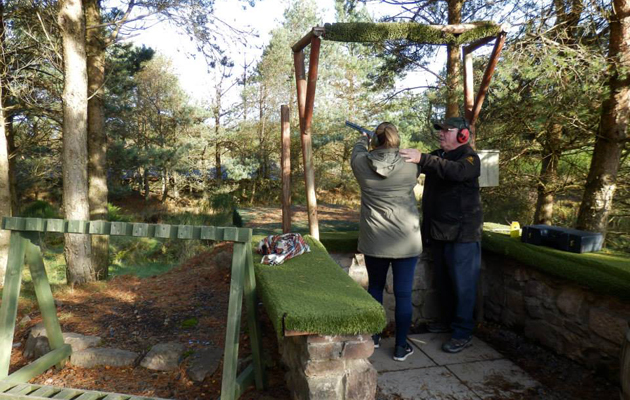 Gleneagles has a fully-fledged shooting school – fledged in more ways than one as the school also boasts an impressive archery range, along with an air rifle set up. With just shy of 20 stands and a selection of adjustable traps, plus a hundred-foot tower, the school can offer simple tasters to first timers or testing targets for experienced Shots. The instruction was flexible too: our party of four had considerably different levels of experience but our instructor James Duncan listened carefully to each one of us and tailored his tips accordingly so that no one felt patronised or bamboozled by technical jargon. On our way out at the end of the lesson, we passed the archery enclosure and air rifle range, which offers a multitude of static targets at distances of up to 60yds and gives shooters the chance to get to grips with some punchy pre-charged Weihrauchs. It was quiet that day, but James explained that they were bracing themselves for an influx of eager youngsters the following week as schools broke up for half term. As we made our way across the grounds to lunch we got a tempting glimpse of some of the off-road vehicles that the lucky half-termers would get to enjoy: Argo cats for the older ones (ages 10 and up) and scaled down half-sized Defenders for the younger (6 to 12). Our next session was gundog handling. It’s unusual enough for a hotel to have its own shooting school, but it’s even rarer to have an on site gundog school. 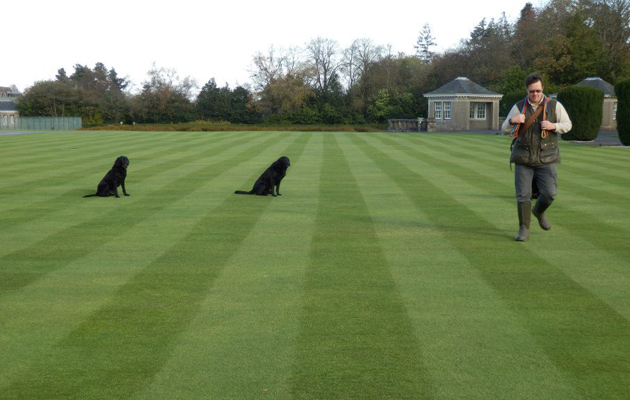 None of our party had done any serious dog work before, so Stuart Lowe, one of the school’s instructors, gave us a demonstration with three of Gleneagles’ working Labradors. After explaining some basic commands and signals, he let us have a go at directing a dog to mark and retrieve a thrown dummy. Guests are also welcome to bring their own dogs. The hotel is very dog friendly and dogs up to the size of a Labrador are welcome to stay in guests’ rooms (subject to an additional fee to cover cleaning costs). The hotel also provides a dog welcome pack and can arrange to have food prepared. For larger dogs, or dogs whose owners don’t fancy canine companionship at quite such close quarters during their stay, kennel facilities are available. From dogs we moved on to hawks with Duncan Eade from the British School of Falconry, also based at Gleneagles. For all of us, this was the most unusual and exiting part of the day. The school was founded in 1982 by Emma and Steve Ford, and established at Gleneagles ten years later. Emma and Steve also run the gundog school and off-road driving, and the Fair Game package was Emma’s brainchild. We took three Harris hawks – two females (Comet and Delta) and a male (Jim-Bob) – and a pair of ferrets to a nearby sporting estate to hunt for rabbits. The strong winds didn’t make for ideal hunting conditions but Duncan and Fiona the ferret managed to chivvy a handful of rabbits from the shelter of their burrows, which led to some great chases. Though the rabbits escaped, it was invigorating to be scanning the hillside for movement and fascinating to see the hawks work as a team, trying to corral and corner their prey once it had been flushed out by the ferret. Thoughts of rabbit remained with me as I changed for dinner and joined Emma and Steve in the Gleneagles’ Strathearn restaurant for our game supper. Fortunately, rabbit was on the menu, as was venison, grouse, pheasant, partridge and salmon… It was a fitting way to finish the fair game experience. As we ate and drank wines picked to match the majesty of the meat, Emma explained that she and Steve, who both shoot as well as hunting game with their hawks and falcons, saw so much game in the course of their work with the falconry school that they decided to find a way to raise its profile with hotel guests. Emma hit on the idea of the Fair Game package as an ideal way to link the main elements of hunting, gathering and eating at Gleneagles. The day’s sporting sessions had certainly shown me that there’s a lot more to Gleneagles than golf. They’d well and truly whetted my appetite for more of the hotel’s extra-curricular activities. Emma and Steve’s dinner table tales of their life in falconry only served to further increase my hunger, especially for game hawking. It’s possibly the only time I can say that I’ve left the table after a four-course feast hungrier than when I sat down. This season’s Gleneagles Fair Game package will be available from 1 November 2014 to 31 January 2015. 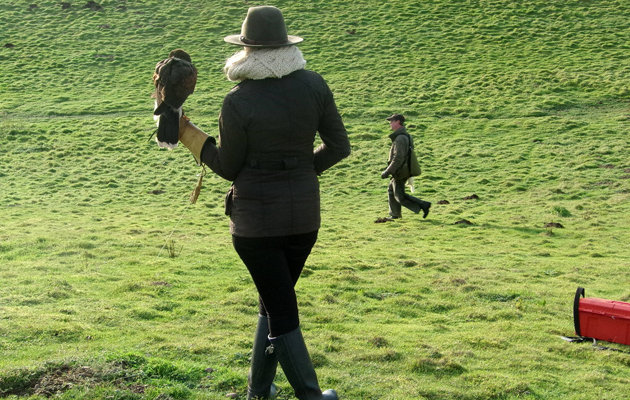 It includes a 45 minute shooting lesson, 30 minute gundog training lesson and one-and-a-half hours of hawking with the British School of Falconry. It also includes one night’s stay in the hotel, a four course game dinner in the Strathearn restaurant, and what we found to be an unbeatable breakfast. Prices start at £799 per room per night, based on two people sharing an Estate room. For more information on the other activities offered at Gleneagles, visit www.gleneagles.com.